About: Coach & Horses is London's first vegetarian pub. All our dishes are freshly made here. We offer vegetarian dishes but also have some outstanding vegan choices. All our dishes are suitable for meat eaters and some have been specifically designed to satisfy carnivorous desire. There is seating on the pavement area, weather permitting, and a Happy Hour. 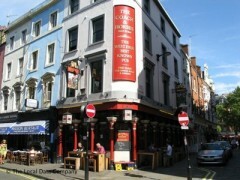 The Dog and Duck is a popular after work pub on Bateman Street with a killer quiz up its sleeve. On looks it’s a typical London pub, however, the clientele are a friendly bunch and if they’re not inside they’re spilling onto the pavement outside. It also maintains a good selection of real ale. "The West End’s best known pub"
The Coach & Horses is the epitome of heavy drinking and bohemia, where thesps and winos congregate of an evening (or at any point after 11 am) to put the world to rights. George Melly and Francis Bacon were known to drink here, as did Jeffrey Bernard, who would write detailed accounts of his inebriation in his Low Life column for The Spectator magazine. To drink here is, one would suppose, to drink in a piece of London’s history, however at first glance it’s a boozer like any other. Its traditional, somewhat battered appearance is at odds with some of its flashier neighbours, however a cosy atmosphere permeates The Coach & Horses that attracts Soho’s less boisterous (and most colourful) characters. There is a pleasant dining room upstairs serving standard pub food such as pies and fish and chips - named The Private Eye Dining Room, as this is their staff members lunching venue of choice - and if you head down on a Wednesday night you can take part in a pub sing-a-long, as long as you buy the pianist a pint. a bloody good boozer. Well worth a visit.